As climate change continues, global temperatures will increase and hurricanes will become both stronger and more frequent. Sea turtle nesting occurs during hurricane season and warmer summer months, leaving the developing eggs exposed to potentially harmful environmental conditions including erosion, flooding, and high nest temperatures. 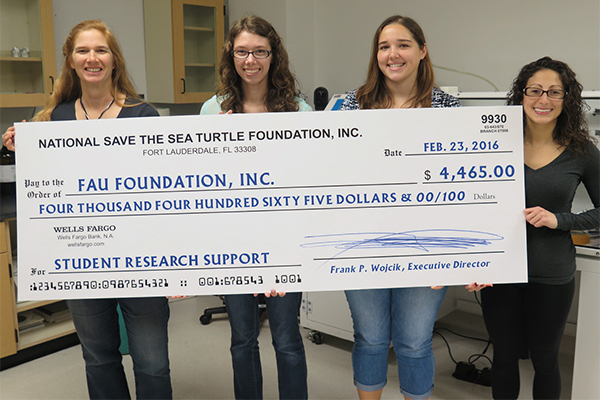 FAU’s Dr. Sarah Milton, Rachel Bladow, Andi Reis, and Courtney Cocilova receive $4,465 from The National Save The Sea Turtle Foundation to help fund Ms. Bladow’s research. to follow changes in beach dynamics as it is altered by storms or human development. We will also install flood monitors to measure periods of nest inundation and temperature data loggers to track nest temperatures. Then, I will collect any green and loggerhead eggs that do not hatch and analyze embryonic development. This will allow me to determine if there are species differences in susceptibility to inundation or increased temperature, or if some periods of embryonic development are more vulnerable to these stressors than others. Any changes to the beach environment will directly impact the nest environment for the developing sea turtles eggs, which could result in decreased hatching success. Preliminary data from the 2015 sea turtle nesting season suggests that high temperatures late in the incubation period are particularly harmful for embryonic development and hatching success. Additionally, on my study site in Boca Raton, loggerhead sea turtles were more vulnerable to storms than green sea turtles, probably because greens nest closer to the beach dune. The results of this study could lead to new management strategies in South Florida to protect sea turtle nesting beaches from climate change. I am grateful for the funding from the National Save The Sea Turtle Foundation, which will allow me to continue my project through the 2016 sea turtle nesting season.